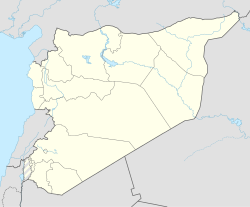 Tadmor prison (Arabic: سجن تدمر‎) was located in Tadmur (known as Palmyra in English) in the deserts of eastern Syria approximately 200 kilometers northeast of Damascus (Tadmor or Tadmur is the Arabic name for destruction ). Tadmor prison was known for harsh conditions, extensive human rights abuse, torture and summary executions. A 2001 report by Amnesty International called it a source of "despair, torture and degrading treatment." It was captured and destroyed by militants of the Islamic State of Iraq and the Levant (ISIL) in May 2015. The structures were originally built as military barracks by the French Mandate forces. During the 1980s Tadmor prison housed thousands of Syrian prisoners, both political and criminal and it was also the scene of the June 27, 1980 Tadmor Prison massacre of prisoners by Rifaat al-Assad, the day after the Syrian branch of the Islamist Muslim Brotherhood narrowly failed in an attempt to assassinate his brother, president Hafez al-Assad. Members of units of the Defence Brigades, under the command of Rifaat al-Assad, entered Tadmor Prison at dawn and killed an estimated thousand prisoners in the cells and the dormitories. The massacre is well known throughout Syria. Tadmor prison was closed in 2001 and all remaining detainees were transferred to other prisons in Syria. Tadmor Prison was reopened on June 15, 2011 and 350 individuals arrested for participation in anti-government demonstrations were transferred there for interrogation and detainment. In May 2015 Tadmur was captured by the Islamic State of Iraq and the Levant who also took over the prison and released a video of its interior. ISIL militants used explosives to blow up the prison complex on 30 May. ^ "SYRIA: TORTURE, DESPAIR AND DEHUMANISATION IN TADMUR MILITARY PRISON". www.amnesty.org. Amnesty International. 18 September 2001. Retrieved 2016-07-10. ^ a b "Islamic State blows up empty prison complex in Syria's Palmyra". Reuters. 2015-05-30. Retrieved 2015-05-30. ^ Kerry Pither. "Dark Days: The Story of Four Canadians Tortured in the Name of Fighting Terror", 2008. ^ "The multiple symbolisms of Palmyra: Stones that speak". The Economist. Retrieved 30 May 2015. ^ "Syria: Mukhabarat and the desert prison". Intelligence Quarterly. Retrieved 2015-05-30. "Inside Tadmur: The worst prison in the world?". BBC. 2015-06-20. This article about a building or structure in Syria is a stub. You can help Wikipedia by expanding it. This page was last edited on 21 June 2018, at 10:22 (UTC).